It is a confident Connacht that heads to the Welsh capital for tomorrow evening's Guinness Pro 12 fixture against Cardiff in Arms Park (7.05pm ). As league leaders and backed by a run of eight successive wins, Connacht are in the relative unusual position of being favourites to win. Cardiff, who have only lost twice at home to Connacht in 13 seasons, are having a poor season, currently in 10th place and with just one win. Yet Connacht will be wary, according to captain John Muldoon, who will become the first player to make 200 appearances in the Guinness Pro 12. "This is a huge game for us. In the past we've shown we can produce a big game, but it's to back it up the week after that. This will be a test of what we are and where we have come from, so hopefully everyone is switched on for Cardiff," says Muldoon. "Cardiff is a tough place to go to. If you look at their results, they have the most losing bonus points of any team even though they have lost a good few games. It reminds me of us a few years back when we knew that if we had turned some of those losing bonus points - seven or eight - into wins, we would have had a really good season." Once again Connacht have been hit by injury - star player Robbie Henshaw ruled out six weeks with a fractured hand. Having started at fullback against Munster in only his second Pro 12 game this season, Henshaw suffered the metacarpal fracture in the last couple of minutes of Connacht's much-celebrated first win over Munster in Thomond Park in 29 years. Henshaw, who had played a big part in Bundee Aki's decisive try that resulted in Connacht's 18-12 victory, had then contested the restart when the injury occurred, ruling him out of action for the crunch festive interprovincials with Ulster and Leinster, and the back-to-back European games with Newcastle. Henshaw's loss has also been exacerbated by injuries to No 8 Eoghan Masterson and prop Denis Buckley. Masterson, having also suffered a hand injury with a thumb fracture, and Buckley, with a high ankle sprain, are both expected to be sidelined for three weeks, while open side Nepia Fox-Matamua's injury has been confirmed as an ACL, ruling him out for the season. However in welcoming the return of Rodney Ah You, who was in New Zealand following the death of his father, Quinn Roux (nose surgery ), and the trio of Eoin McKeon, Ben Marshall, and Dave McSharry, all of whom have been cleared after concussion, Lam says it has always been about the squad, not the individual. "We have had a pretty hard run of injuries, but what we have been doing is around team work, and the next guy just steps in," says Lam. "We have a lot of confidence in the fact that we went down to a Munster team and they were gunning for us. It was top of the table and a lot of physicality was talked up before by both teams. Ultimately we came away with a good win based on what we do as a team. "To win it was special for guys like Ronan Loughney, John Muldoon - local boys who have been here for a while, and that is one they can tick off, and then we move on. When I was first here I was asked,' how are you going to get consistency?' I think we are now eight games on the trot, and it's about being consistent every day in what we do." In recent years there has been little between the sides, but last year's one-point defeat left a bitter memory. Connacht have learned since how to close out games - that defeat coming some nine minutes into injury time. In the aftermath Lam was fined for his aftermatch comments and Mils Muliaina was accused of assault following a late night incident in the city - a charge which was eventually withdrawn. However Lam will not want his team to dwell on those issues, but continue to concentrate on doing their jobs on the field, as they did against Munster. 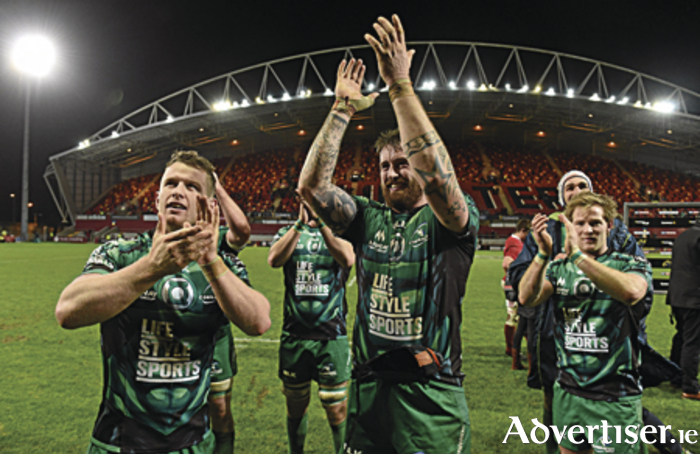 That 18-12 victory - the first in 29 years in Thomond Park - has certainly put Connacht on the radar, but it was a performance that came as no surprise to Pat Lam and his squad. "We have had our review and going through all our good stuff and things we could to do better, and as it came about we channelled all our aggression and physicality into our jobs and into our techniques. That gives us confidence in what we are doing as a group. Now we will face everyone after us, but if we focus on that, we will get caught; if we focus on our jobs, we have a better chance of continuing our run." Munster were 2/9 favourites to win last Saturday, but it was Connacht who took the game to their opponents from the kick-off, playing the better rugby with ball in hand, and overcoming a sinbinning to captain Muldoon and a consequential penalty try. “I was really proud. I looked over at the boys. We’ve been talking about resilience and mental toughness and some of the things we’ve been doing this year, last year and the year before, is about building because you’re going to be thrown challenges. That’s what life is, that’s what rugby is. “So what I saw when that happened – I obviously didn’t agree with it – but what I watched is what I saw in Moscow when flights got cancelled. The boys just get on with it. “The telling is we got back into our structure. Everyone did their roles, we put pressure on in defence, we got some turnovers and we were able to go back at them again. That was the sign that the boys mental toughness and resilience was on. We just did what we train,” said Lam. Having dominatd possession and territory in the first half, Connacht had a 10-5 half time lead.Fullback Tiernan O’Halloran had danced through a poor defence for a try - a deserved reward for Connacht's opening 18 minutes. Craig Ronaldson added the conversion to a sixth minute penalty for a high tackle on Aj MacGinty, and Connacht led by 10-0. Munster reverted to type with a rolling maul produced a try for Niall Scannell, but Connacht continued to claim the restarts, maintain their continuity, secure kick and chase ball down the left wing, while the hardworking Aly Muldowney led his pack on the charge. Although Munster upped the intensity in the second half, it was Connacht who moved ahead with a second Ronaldson penalty after some great work on the floor by Muldoon. But when referee Ben Whitehouse, and TMO Simon McDowell, believed Munster would have scored a try but for John Muldoon's early tackle on Andrew Conway, the game was turned on its head. The penalty try converted by Keatley brought Munster within a point, and although Ronaldson missed a 71st minute penalty, Connacht showed their class to the last. From a scrum in their own half, Matt Healy broke before kicking ahead, and when Henshaw cut inside the cover, he supplied Bundee Aki whose spectacular dive clinched the try in and the game. Munster: Andrew Conway; Gerhard van den Heever (Denis Hurley 51 ), Keith Earls, Francis Saili, Lucas Gonzalez Amorosino; Ian Keatley, Tomas O’Leary (Duncan Williams 66 ); James Cronin (Dave Kilcoyne 62 ), Niall Scannell, BJ Botha (John Ryan ’=40 ); Donnacha Ryan (Dave Foley 57 ), Mark Chisholm; CJ Stander (capt ), Jack O’Donoghue, Robin Copeland. Connacht: Robbie Henshaw; Tieran O’Halloran (Darragh Leader 69 ), Bundee Aki, Craig Ronaldson, Matt Healy; AJ MacGinty (Jack Carty 46 ), Kieran Marmion; Denis Buckley (Ronan Loughney 55 ), Shane Delahunt (Dave Heffernan 62 ), Nathan White (Finlay Bealham ’59 ); Ultan Dillane (George Naoupu 64 ), Aly Muldowney; John Muldoon (capt ), James Connolly, Eoghan Masterson (Sean O’Brien 57 ). Referee: Ben Whitehouse (WRU ).